Singing, Snow and Santa Will be Filling the Air! By Edgefield Advertiser on November 8, 2012 Comments Off on Singing, Snow and Santa Will be Filling the Air! 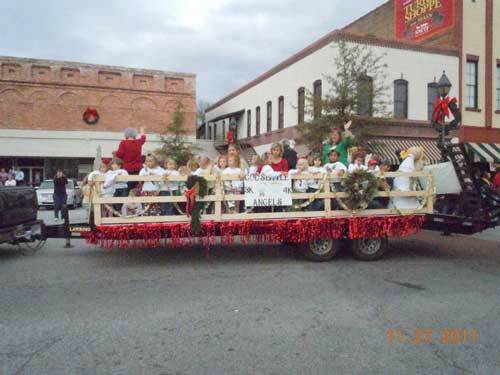 The 39th Annual Edgefield Christmas Parade will be on Sunday, December 2, 2012 at 4:00 p.m. There will be a horse drawn wagon for rides, Singing performances by W. E. Parker Chorus, JET Middle School and STHS Show Choir and others. Entry forms for the 2012 Parade can be found at Edgefield Town Hall, Johnston Town Hall, and edgefieldsc.net. There will be snow on the square and pictures with Santa after the parade! For more information you may call Calvin Henderson at 803-480 -1255.